Though we live in an age where robot helicopters can juggle, and Mercury now has satellite TV, but cross platform co-op is pretty rare. Playing the in the same game as your Playstation 3 owning friend while on your Xbox 360 is pretty much a pipe dream. But maybe a game could talk between two different platforms if, say, they both had the same manufacturer? That's exactly what has happened with a new iPad/Mac game, Guerilla Bob. 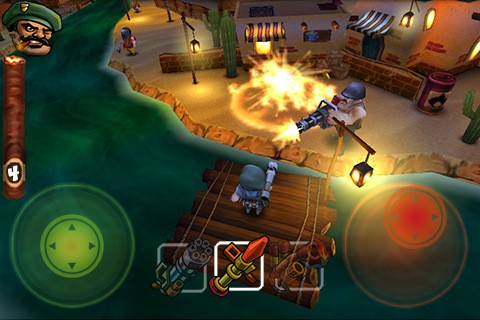 As you can see from the screenshot above, Guerilla Bob is a 3rd person shooter, similar to arcade classics of the past. The formula is familiar, but the ability for Mac and iPad players to co-op with each other certainly isn't. The iOS version is a mere $0.99, while the Mac version is 500% more expensive, though still reasonable at $5. I guarantee you'd spend more than $6 in quarters to co-op through a game like Ikari Warriors just once, so that's a pretty good deal. Page created in 0.2642 seconds.